Maleficent’s evil curse has engulfed the Kingdom and only you can get rid of it and bring the Kingdom back to its former glory. Completing quests, expanding your kingdom, building more attractions is the best way to make the Kingdom lively and happy. 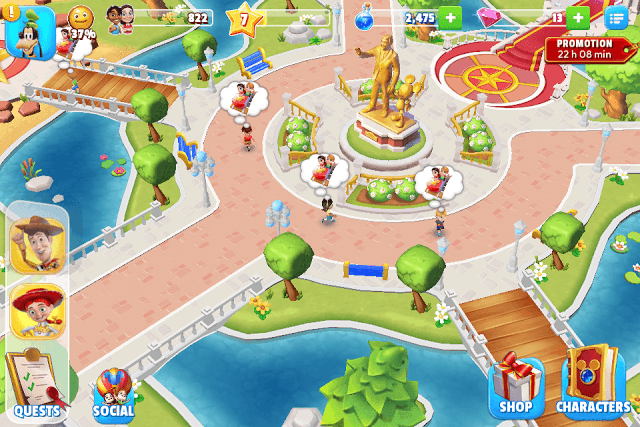 You will also have to manage your theme park by adding attractions and concession stands, welcoming more characters so that visitors get what they want. At the bottom left corner of the screen is the Quest icon. Tap it to open a list of available quests. These are basically main quests that are lined up in sequence. Tap a character’s portrait in the list to know his/her mission and press “Go”. Completing quests is a sure-shot way to earn magic, XP, and rare/uncommon tokens. Story-based quests usually take more time to complete, but grant greater rewards. You can also tap on a character’s portrait at the top-right corner of the screen to get the quest list. If you want to get a list of all quests, just tap on the animated character. The camera will zoom in to the character and a quest board will be shown next to him. There you can see a list of quests and the time they will require to complete it. Several quests will be locked and to unlock them you will have to level up a character. Just besides the Quest icon is the “Social” icon. Tapping Social will take you to your Facebook friend’s Kingdom or an AI’s kingdom. You can visit a maximum of 4 players’ Kingdoms. Tap on a player’s characters to get extra Magic. You can tap a maximum of 3 characters. Once you have visited a player’s Kingdom, a timer will appear below his profile showing the time remaining for the next visit. To your left are two icons – “Shop” and “Characters”. Under Shop, you will find various theme park attractions and decorations. Building new attractions will draw more visitors to the Kingdom. “Featured” attractions usually cost gems. To get a big list, go to “Attractions”. Attractions produce magic and XP. Each attraction’s building time is unique. Some take hours to complete whereas some can be built instantly. The “?” symbol at the top-left corner of each attraction card shows the completion time and Magic/XP it produces every hours/minutes. Under Concessions, you will find a list of Concession stands like Pretzel Stand, Churro Stand etc. These stands produce Magic and XP every few hours. Each stand’s resource production rate and timing is different than the others. Don’t waste precious Magic on decorations unless a quest tells you to do so. Save magic for attractions, concessions, unlocking characters and expanding the Kingdom. Under “Characters”, you will find your favorite Disney characters. Tap it. Each character requires some tokens and magic before he/she can be welcomed to the Kingdom. But first you will have to unlock him/her. You can get them from some attractions or by completing quests. The more characters you unlock and invite to the Kingdom, the more quests you will get access to. Don’t forget to upgrade your characters to unlock extra quests. Once the Quest icon notifies that a character is ready to be welcomed, tap “Characters” at the bottom right corner of the screen and go to the unlocked character. Tap on the unlocked character. You will notice a set of tokens required to unlock him/her completely. A tick mark above a requirement shows that you already have those tokens/items to you. Now tap on the token that that does not have a tick mark above its pic. Tapping on it will reveal a set of quests that may grant the required token. Tap on Go beside a quest to check whether the quest can be completed or not. Complete the quest to get the required token. You may have to complete the quest more than once to get two or more tokens of the same type. Complete quests. A quest will grant Magic according to the time it takes to complete it. So a 60 second quest will give only 5 Magic whereas a 2 hour quest will grant 75 Magic. Attractions and Concessions produce Magic every few hours. 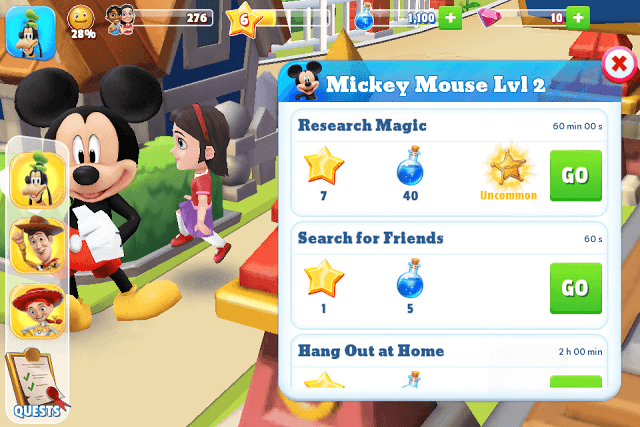 Just tap on a attraction or concession stand when the potion icon appears above it. Tap again to see how many hours or minutes are remaining to get more Magic. 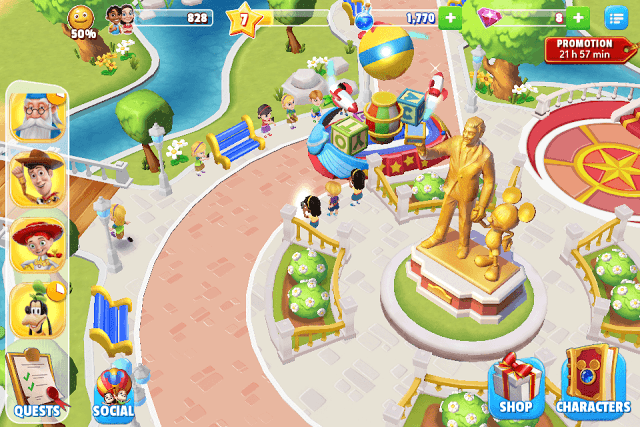 When you begin a parade, quests and buildings will keep giving you bonus Magic until the parade stops. Keep playing when the parade starts to make the most of it. 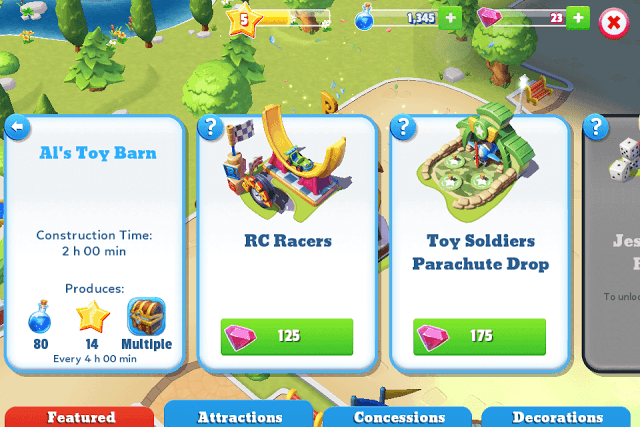 Try to start two parades at the same time by unlocking another slot with gems. Visit friends Kingdom via the Social button. Once you are in their Kingdom, tap on the green tick mark above each character to get bonus magic. You can tap a maximum of 3 characters per Kingdom. To start a parade, tap on the “Parade Tent” next to the castle and assign an unlocked float by sprinkling some Magic. 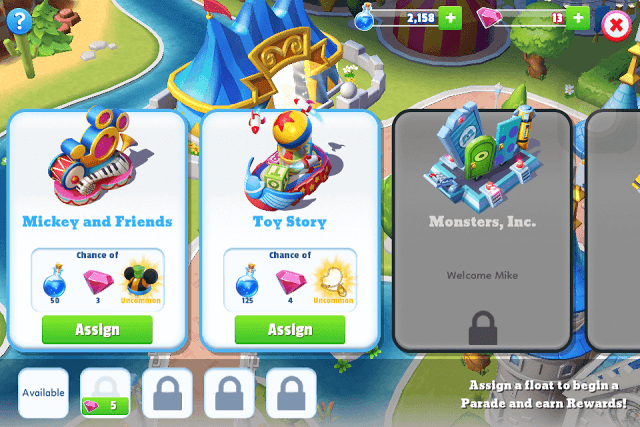 You can assign more than one float and start an additional parade, but for that you will need to unlock a float slot using gems. 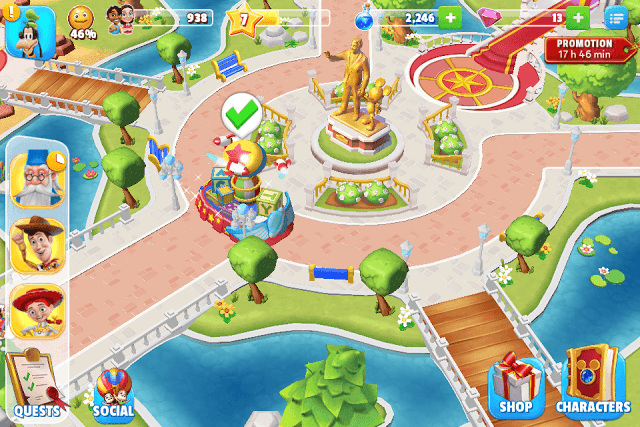 When a parade starts, attractions and concessions produce more magic and XP. Quests may also give bonus rewards. You will stop receiving bonus rewards when the parade stops. A parade also gives a chance to get magic, gems and an uncommon token which can be of immense use in upgrading or welcoming a character. Each float has a unique reward set, so have more floats in your parades to get these rewards. When the float stops moving, tap it to get your rewards. You can earn some gems by starting a parade, but did you know that gems can be earned by leveling up and upgrading your characters? The quickest way to level up is to build more attractions and concessions. Each building produces some XP and so having more buildings will make it easier for you to level up faster. Another way to get gems is to level up your character. To do this, you will have to go to “Characters” and tap a character to know what the upgrade requirements are. Follow Tip no. 1 in this guide to know how to get tokens to upgrade a character. You will earn more rewards by making your visitors happy. After all, the best way to lift the curse is to spread happiness and to do this you will have to fulfill certain wishes of kids who arrive at your Kingdom. Noticed a smiley at the top-left corner of the game screen? Well, it’s the Happy Meter. 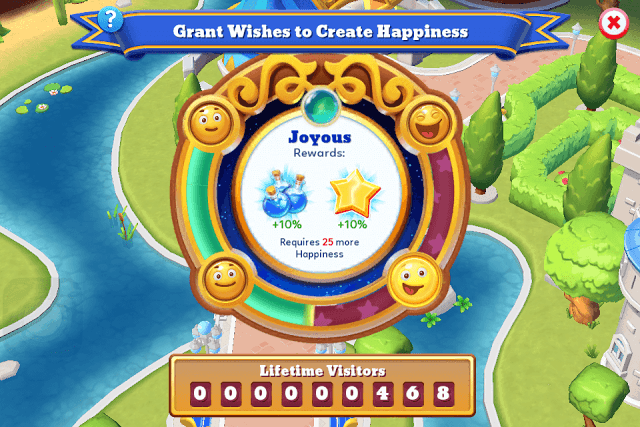 The meter fills as you keep granting visitors’ wish. The more wishes you grant, the faster the meter fills up. Once the meter gets past a happy icon, you receive a reward. There are 4 main types of happy icons: Content, Cheerful, Joyous and Ecstatic. Every time the smiley reaches 100 percent it reaches a happy icon. When the meter fills up to Cheerful, it allows you to start parades. When it reaches Joyous, buildings produce 10 percent extra XP and Magic and completing quests also grant more resources. And when it fills up completely and reaches “Ecstatic”, chances of getting a rare/uncommon token from an attraction/concession are more. Wishes appear above a visitor inside a speech bubble. A roller coaster speech bubble above a kid suggests that the kid wants to visit an attraction. A speech bubble with a Disney character on it suggests that the kid wants to meet that character and wants him/her to do a task for him. Tap on the speech bubble and the visitor will automatically move to the nearest attraction. If it’s a character, then he/she will go to that character and the Disney character will fulfill their wish if he/she is not busy with a quest. Once his wish is fulfilled, tap on the smilies he/she drops to collect it. Wishes don’t appear every time, so you may have to come back later to find them. You may close the game and open it after a few minutes to discover new wishes from visitors. With more kids visiting the Kingdom, chances of getting wishes are more. Increasing happiness will attract more visitors. Just make sure you have plenty of unique attractions so that more wishes can be fulfilled quickly. Keep playing the game, expanding Disney’s Magic Kingdom to discover hidden attractions and increase happiness to attract more visitors and get more rewards. I keep getting more characters, buildings, etc.. however I haven’t been given or can get any additional land. Am I supposed to constantly put something away to use something new? Very Frustrated. You will have to expand your kingdom using magic potions. Please see my reply to “Ab” know more. How can I expand and unlock areas? To expand an area in your kingdom, you will need “magic” (blue potion bottle). But before expanding, you will need to unlock an area, which can be done by completing quests of certain characters. 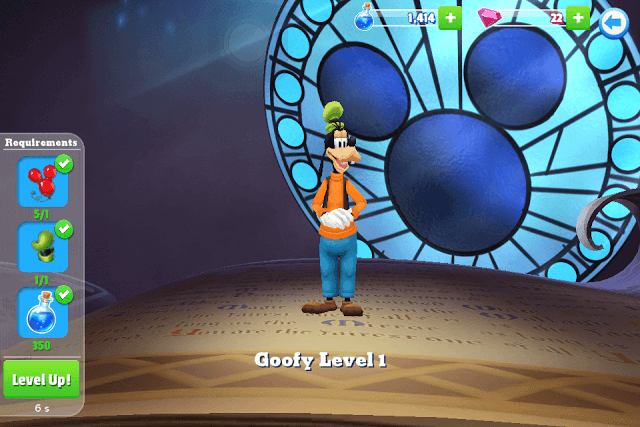 For example, to unlock the roller coaster ride area, you will have to complete a set of Goofy quests. You can get potion bottles from buildings. Complete quests or follow the directions of Marlin the Wizard. Unlocking lands are time consuming so, be patient. How do you change the language on this app? On your game screen, tap the menu icon (three dots/three lines). It can be found on the upper right corner of the screen. A new window will pop up. Under “Settings” tap “Language” to switch to a different language. I don’t see anything about how to adjust settings or zoom the camera in and out. Using two fingers, pinch-out to zoom in and pinch-in to zoom out. To access settings, tap the menu icon (three lines/dots) located on the upper right corner of the screen. Under menu, you will see a separate “settings” section where you can change sound and notifications. 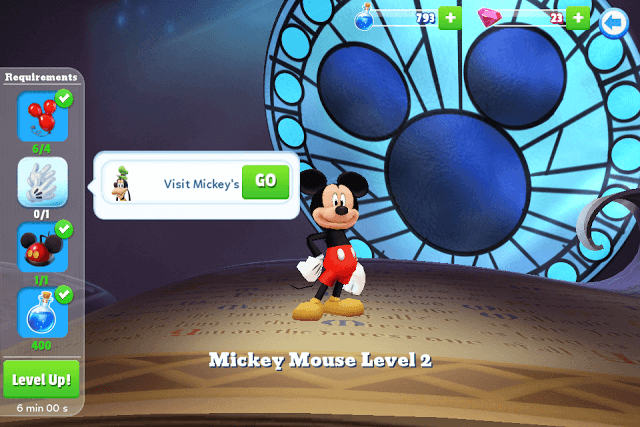 I see a lot of visitors with a certain Disney character above their head and when I click them, the game takes me to the character, but the visitors never go there. I want to send all visitors to the character they have above their head. How do I get the visitors to go with a happy smile? You need to assign the task to the character with the happiness icon by it. It is usually the first one. For Mickey for example, it might be “Research Magic”. The children will stand by him watching him. At the end of the task, then there will be a lot of happiness rewarded.